I was standing in a bright white room surrounded by embedded cameras and light reflective panels. “Three…” began the countdown. It was my idea of a nightmare. I loathe having my photo taken. All this started with a trip to China last summer, courtesy of Huawei. As a takeaway gift I was given a cartoon mini-me. This was an outsized version of my head, based on my Twitter profile, wacked onto a random figurine body. I couldn’t decide whether to be stupidly amused… or horrified. “Two…” ran the countdown. I was staring fixedly at the marked spot, my feet were glued to position. My full-length 360 degree image was captured almost instantly and beamed to the computer in the office next door. If I didn’t have something akin to a phobia, it would have been entirely painless. Now as the technology improves and most importantly gets cheaper, this could well be one future of photography. 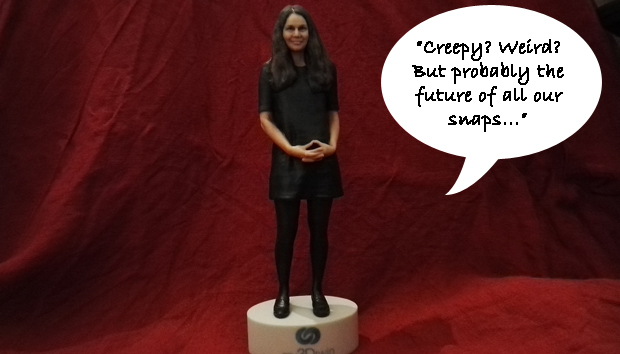 It would most likely comprise of both 3D printed dolls, and digital avatars. And evidence suggests interest in the technique is rising. Not surprisingly this was reported as a big thing in Japan last year. More surprisingly perhaps, an outfit called Twinkind is doing good business across Germany. While my3DTwin – the studio I visited in London – has been operating in the UK since 2011. At present it is not cheap though, a 15cm avatar comes in at £120 ($180), 20cm is £175 ($267) and 25cm costs £250 ($380). 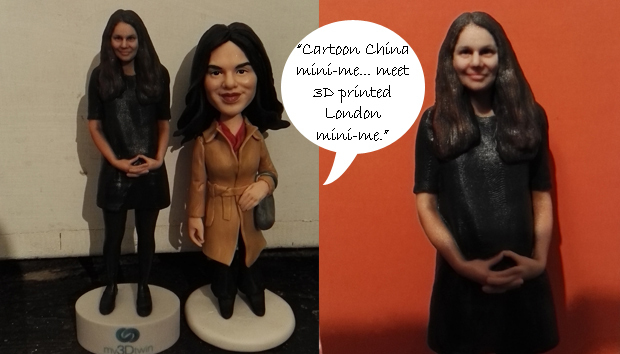 There are cheaper, simple versions – like my China mini-me – available online via a variety of companies. Organisations like Cubify offer the opportunity to put your head on a superhero’s body, Shapify produced this hilariously awful video [YouTube] to promote its service. While in May large retailer ASDA launched its own service. The funny thing about all this – something that I felt particularly strongly tipping up at the studio – is that my 2015 experience must be something akin to that of Victorians going to get their portrait taken for the first time. This partly comes down to novelty value and partly the expensive equipment. “It is still a bourgeoning market,” says Charlotte Bloomsbury who makes up part of the small team at my3DTwin. Many people still see it as “a bit creepy”. Yet the use cases are going up. One man came in and had his outsized feet scanned to he could take them to a specialist cobbler, says Bloomsbury. Some people are turning themselves into chess sets. While the University of Arizona has commissioned a mini-90-piece-orchestra. “People are open to be more excited than they were a few years ago,” adds Bloomsbury. These are also finding employment as wedding decorations, graduation mementos and marketing gimmicks. While big companies are using them to produce team group avatars. I also contacted Twinkind and ASDA, for further comment, but nobody responded. “I do think it is going to be really big,” says Bloomsbury. “It is the next step in capturing people.” At the moment she feels the camera is very expensive and the tipping point will only come when the cost is reduced. “You never know how fast things can come along,” she says, but suggests the truly everywhere Photo-booth printing option won’t be on the market for another 20 years. The possibilities also exist well beyond the figurine market. There is a lot of potential in first person 3D gaming. While Lucy Wimmer, Director of Corporate Communications DataSift told us recently that she believes “3D selfies and holograms” will be the future of selfies. “There are so many possibilities and none of them are worked out yet,” concludes Bloomsbury. Do smartphones make us vainer?